A new platform for mobile apps for tank container depots has been launched, with the aim of improving efficiency and speeding up operations. DEPOT for Mobile makes it possible to digitalise all workflows that are currently done on paper, offering real-time insights and faster processing. In the app, which is an extension to DEPOT Software, data is entered a single time and then becomes available for all stakeholders in a secure, reliable way. Data may then be used interdepartmentally within the container depots, and the client or facilitator can access up-to-date information at any time. 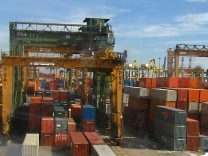 One process set to benefit is that of checking containers in and out of the port. The inspection of the container that now happens on paper can be done in the DEPOT for Mobile app so that the report becomes immediately available to all departments and no paper has to be exchanged. The depot worker will be notified in real-time when a container is pre-announced for check-in and the carrier will be informed when the container is ready for transportation, streamlining the whole operation.